The 4600 High Precision Thermometer is designed for use with the 400 series temperature probes offered by Ixthus Instrumentation. Between 0°C and 50°C, the Thermometer is accurate to ±0.015°C, meaning that, when used with a probe, the system accuracy is ±0.115°C in this temperature range. 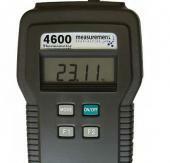 The 4600 Precision Thermometer can display either °C or °F temperature readouts, and has RS-232 communication capability.